Worry free wifi with a strong signal for all of your devices. Your speed- is only yours! You don’t share your internet with anyone but your household like in larger cities. 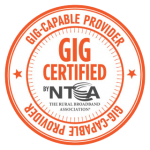 The NTCA Rural broadband Association named Hartelco a Gig-Capable Provider in July 2017. Ala Carte means a phone line is required, and the phone line and High-Speed Broadband are not included within a bundle package. See below for bundle packages which many times are less expensive than ala carte rates. All internet rate packages include unlimited usage and 2 email addresses. Residential bundles include our 10 Mbps Broadband Speed at substantially discounted pricing for both monthly charges and installation charges. All Broadband DSL packages are available throughout our entire rural exchange area. *Additional long distance minutes are 8 cents a minute. Installation with a Bundle Pkg is waived. When you have a landline phone, there is a $185.00 installation charge for ala carte Broadband High-Speed Internet for a single computer. This installation charge can be waived with a 6-month contract. Connecting multiple computers are charged at the normal time/materials rate of $75.00 per hour. All customers are served by fiber optic cable, therefore you do not need a modem. Free internet & IPTV installation with a 6-month business contract! Technical support for internet is just a quick phone call away 24 hours a day, 7 days a week. Just call us at 402.254.3901 and we’ll be happy to assist you! Wholesale DSL Transmission Service for Internet Service Providers – Contact Mike Becker, General Manager.